Rob Mensching on Software Installation and Open Source at Microsoft. Windows Installer XML Toolset is 2 years old. Most importantly, we're still growing. For example, we started with just the core toolset. Votive joined the WiX project very soon thereafter. The CustomActions continue to be advanced, with an impressive addition by Fredrik in the first year. Thanks to Bob, the WiX toolset later added a very easy to use standard UI sequences. And Reid, created the very cool WiX CodeDOM that opened the doors to our new breed of code generation tools. Even more recently, we introduced WiX v3 and ClickThrough (our first code generation tool). Just tonight Derek made the first check-in of a new tool in v3 called heat that will greatly reduce the amount of time necessary to get started with the WiX toolset. I'll let him discuss that tool in more detail. Finally, we now have a much improved release process that allows us to get our weekly builds pushed up to SourceForge. Soon, I'll get Gabor's localization work integrated and the WiX standard UI will go global. Looking forward we have much to do. First, we're in the process of locking down WiX v2 to reach a final build that everyone can standardize on. It's been slow going but we're still inching towards that goal. 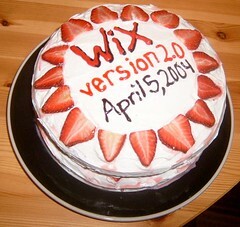 Second, Derek is plowing through WiX v3 features and has really done some cool stuff there. I'm moving further into ClickThrough and a standard bootstrapper/chainer/setup.exe for the WiX toolset. Justin, of course, continues to advance and improve the Votive experience while K continues to inch his way through the CustomAction bugs. Something I'm going to focus on in the coming year is how to get more people participating in the WiX toolset development and see if there isn't something we can do to get some more reference material and examples into the documentation. I stop and think about where we are at today and I can't help but smile. This is so much fun and I'm definitely looking forward to the next two years. Congratulations! I think I’ve been around here for about a year now and plan to stay around much longer. WiX rules!